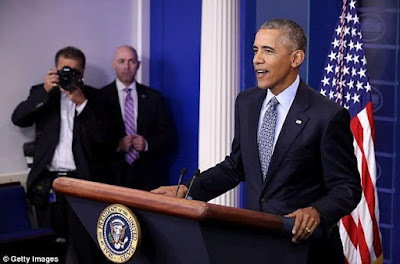 Outgoing President, Barrack Obama, who had earlier said he was going to take some quiet time off and even do some writing after he steps down, has now issued a warning to Trump, letting him know that he will not be silent if he notices Trump's policies and actions as president goes against certain core values and infringes on human rights. Obama made this known during his final press conference on Friday. Some of the issues he brought up which could cause him to step out of the sidelines include; systemic discrimination, effort to silence dissent or the press and efforts to roll back voting rights. He also spoke on Trump's promise to deport illegal immigrants and warned him about 'rounding up' children for deportation. "And for me, at least, I would put in that category efforts to round up kids who have grown up here and for all practical purposes are American kids, and send them someplace else, when they love this country, they are our kids' friends and their classmates and are now entering into community colleges or in some cases serving in our military ..."
"The notion that we would just arbitrarily, or because of politics, punish those kids, when they didn't do anything wrong themselves, I think would be something that would merit me speaking out." Obama said. As president, Obama had actions in place to protect these immigrants but Trump has threatened to undo those actions when he becomes president. 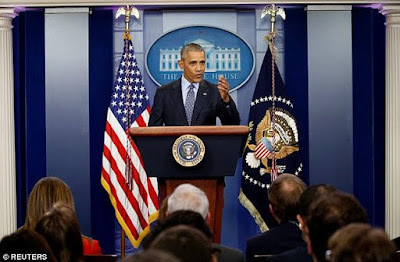 Obama also touched on the issue of Trump's continuous bashing of the press, CNN especially, and the threat from his press team to kick reporters out of the white house, saying that the press is what keeps them honest and accountable. "Having you in this building has made this place work better, it keeps us honest ... it makes us work harder,' he said." Obama concluded by stating the possibilities that could result from being accepting of people and keeping opportunities open to everybody. "If in fact we continue to keep opportunity open to everybody, then, yeah, we're going to have a woman president, we're going to have a Latino president, we're going to have a Jewish president, a Hindu president,' Obama said. 'You know, who knows who we're going to have?" "I suspect we'll have a whole bunch of mixed-up presidents at some point, that nobody really knows what to call them. And that's fine."